Sometimes, we are so eager to play the saxophone, we forget that it requires basic saxophone maintenance in order to keep the pads clean, and the keys working fluidly. Learning to play an instrument requires also learning to maintain it in the best shape possible so that nothing can get in the way of acquiring a great tone and technique. Want a full sound throughout the range of the saxophone? 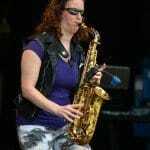 Sign up below for my weekly newsletter for practical tips and solutions to improve your musical performance, and get a Free Video: 3 Tips to Fatten Up Your Saxophone Tone.